There are lots of reasons to “really like” an album, and none of them is wrong. Pyromania is a great example of your bunch-of-good-songs concept and cohesive whole concept. Especially in context (and in context is also a reason), Pyromania stands out as the album where a band took the sound it sorta discovered on the previous album and fleshed it out for a whole ten songs. It was the album where it found part of its audience, before it found its WHOLE audience (and thus jumped the shark, if you ask me). I will always love Pyromania for the way it excited me about good pop metal, and I’ll always be disappointed in Hysteria for the way it went too far. Our classmate Derek said before Def Leppard’s performance in Honolulu, where the band promised to play Hysteria in its entirety, “They were going to play five songs from that album anyway; now they’re going to play the even worse ones too, when they could use that time for their better songs.” It was a good point, but we were in the minority of the audience who was disappointed by this because of course. There are lots of reasons to “really like” an album, and none of them is wrong. Agreed. I do think an album one really likes is not necessarily the same as a great album, though. And I don’t think all definitions of a great album have equal merit. Pyromania is a great example of your bunch-of-good-songs concept and cohesive whole concept. I wouldn’t be surprised if this was the case. I never went back to listen carefully to have a strong opinion. Pyromania stands out as the album where a band took the sound it sorta discovered on the previous album and fleshed it out for a whole ten songs. Like they found a sound, but refined and perfected it? If so, I think that’s definitely something that makes an album noteworthy. Hmm, I want to think of some examples of this. Any other that come to mind? Also, I think what’s interesting is that while some artists take time to find the right sound and perfect it, so to speaks, others seem to find it on the first album. Actually, I think I feel like it might be more accurate to say that they succeed on the first album, while the subsequent albums never really match the first. I think of something like Pat Metheny’s first album as a leader. This is not a great example as his voice definitely developed in a way where later albums might have been better and better expressions. On the other hand, a part of feels like some of the vocabulary he develops, in terms of his soloing, was really interesting and original, and I wonder if his solos in later albums is as original sounding. It was a good point, but we were in the minority of the audience who was disappointed by this because of course. If the entire album was great, would you have liked this? I’m not sure I would, especially if the group had a lot songs I liked. In general I prefer smaller combos over big bands, but I really like when Watson works with a big band. In addition to his compositions, which I like, he seems to have a unique way of arranging the instruments, and I really like it. One of my favorite groups, and Steve Masakowski is one of my favorite guitarists. I found this CD in the $1 bin, and I was surprised at how much I liked it. When her stuff first came out, it seemed like perfectly enjoyable singer-songwriter pop, but it’s not something that that made a big impression. Anyway, I don’t really listen to this a lot, but I feel like it’s done a decent job of standing the test of time. I love the blend of a Euro pop and samba/bossa nova. There are one or two songs I don’t care for, but overall this is a good album. What’s interesting to me is that, on some level, this sounds like Basia used drum machines and synths in a home studio–but the songs and Basia’s singing shine. When her songs came out, I think I might have grew tired of them as they were overplayed on the radio, but her music on this still appeal to me. The first couple of albums my sister and I bought with our own money were greatest hits compilations: Air Supply’s Greatest Hits and the Commodores All The Great Hits. Then I bought a couple of albums on my own: Andy Bumatai’s Live in Waikiki and The Sugarhill Gang’s self-titled debut. I was in fifth or sixth grade and hadn’t really thought much about albums and what made them different from singles. But then I bought Styx’s Paradise Theater, a concept album, near the beginning of seventh grade, and it influenced the way I thought about albums for the rest of my childhood. There was the album cover, for starters. On the front: a beautiful theater with spotlights and a marquee. On the back: the same theater, decrepit and barely standing. It wasn’t one of those SUPER conceptual concept albums, like their next studio album (Kilroy Was Here) would be, or like many of the concept albums I love today. There wasn’t a narrative, and one song wasn’t necessarily followed by the next (with a couple of exceptions). 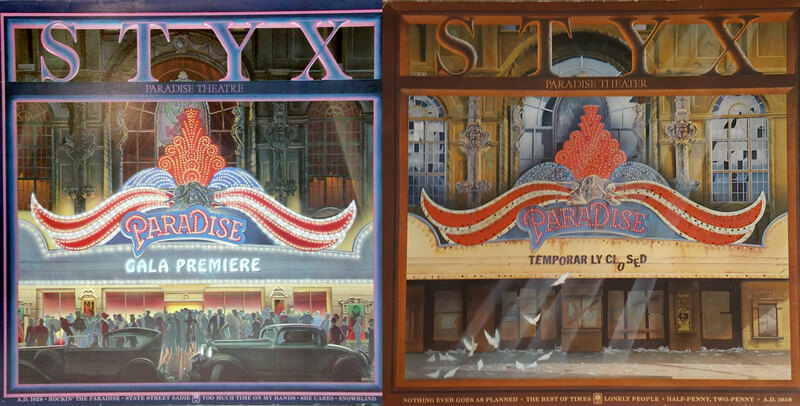 But there were the bookends: 1928 and 1958, the years the historical Paradise Theater opened and closed. The idea was that we were listening to the last show played at the Paradise Theater. There were a few lyrical themes (the word “paradise” is in four or five of the songs). While a couple of songs could easily have been on the album before it (Cornerstone, which featured “Babe”), I don’t think any could have been on the one after it. That really set the tone for me. I had the Commodores greatest hits albums as well (in cassette form). Strangely, I also had the Kilroy album. I think my grandparents bought it for me when they went to Japan. By the way, what are some of the best or favorite conceptual albums for you? You’ve all probably heard one song from Dead Winter Dead: “Christmas Eve (Sarajevo 12/24)” which is super popular for TV commercials around the holidays and for those extreme houses with music-synchonized Christmas lights. Also the song that led to the birth of Trans-Siberian Orchestra and probably the demise of Savatage, alas. Trans-Siberian Orchestra makes tons of money every holiday season, with two or three traveling shows in North America, and I wish I could stand up in front of every audience and say, “This music you’re paying $99 for exists in other places! Pick up a Blind Guardian album! or a Within Temptation album!” But whatever. I’ve heard version of that song, but I don’t if it’s the exact same one. By the way, I like Dark Side of the Moon, too. I bought a cassette after college, and used to listen to it while driving. I think you told me that Pink Floyd is considered prog rock. They don’t seem that way to me, but in any event, they’re one prog rock group that I kinda like.